Henry Chester-Master Garling, who in losing an election lost also the prospect of a new hat, was born in Camden, New South Wales on 7 June 1870, to Clarence William Henry Garling, a bank manager, and Mary Catherine, née Gardiner, of Lake George. Educated to secondary school level, Garling worked for Henry Bull & Co. and for the insurance firms of Michael Metcalfe and Co. and South British Insurance before taking up a career in the Bank of New South Wales. He managed several country branches and became an inspector. After thirteen years, he left the bank to study law and was admitted as a solicitor in 1905. He practised law, becoming a partner in James Gordon Long’s law firm in Young. The firm, Gordon and Garling, later maintained a branch in Sydney. While in Young, Garling took an interest in municipal matters and public affairs. He was a member of the council of the New Settlers’ League of Australia, on the executive of the Young Repatriation Committee and secretary of the Young branch of the Liberal Association. After moving to Sydney, he became an alderman on the Woollahra Council representing the Double Bay ward from 1921 to February 1922 when he resigned. On 15 December 1921, Garling, who had stood unsuccessfully for the Senate as a Nationalist candidate in 1919, was selected by the New South Wales Parliament to fill the Senate casual vacancy created by the resignation of Senator Pratten. During Garling’s short career in the Senate—made even less significant as a result of Parliament being prorogued from December 1921 to June 1922—he spoke on important matters of public policy, including immigration, land settlement and defence. He displayed an informed curiosity about matters such as the contents of the Parliamentary Library, commenting that ‘the works . . . on jurisprudence . . . are as old as the hills’. In his first speech to the Senate, Garling, while commending the achievements of the Washington Conference, warned against reducing defence expenditure: ‘We are a young country, surrounded by perils . . . preparedness is our best insurance against war’. Garling was concerned about the plight of naval and military personnel (involuntarily retired in order to reduce the defence forces) and their lack of access to superannuation and retirement pensions. He argued that defence contracts between military personnel and the Crown should incorporate rights and responsibilities for both parties. He supported a proposal that an Australian ‘commissioner’ (other than a trade commissioner) should be appointed to the United States: ‘we must look to the United States of America to help us in the coming fight . . . to support us in our policy of insuring the freedom of the Pacific’. Garling believed that Australia could be adequately populated only through immigration and land settlement. He was concerned that if Australians did not ‘make use of this great heritage’ they would be dispossessed. Characteristically, he spoke of Britain’s Empire Settlement Act of 1922, urging his colleagues to support immigration from Great Britain in order to establish a ‘strong British race’. Noting that the British scheme for assisting emigrants was threatened in Australia by state rivalry and ignorance of the benefits of immigration, Garling enthusiastically outlined his ideas for promoting British immigration to Australia through ‘moving pictures’ which, he claimed, ‘have a wonderful effect upon the people’. Outside Parliament, he supported the Million Farms scheme in rousing terms. 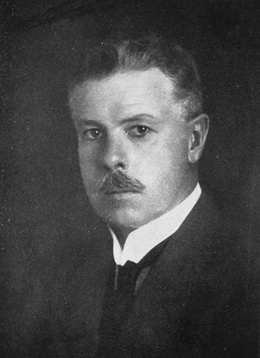 Despite energetically contributing to debate, Garling approached the 1922 federal election with little confidence. The President of the Senate, Thomas Givens, not sharing Garling’s pessimism, entered into a wager that he would be returned—the wager being a new hat. Givens’ confidence was based on his expectation that the candidates’ names would be placed on the how-to-vote cards in alphabetical order, as had occurred at the previous election. Thus Garling would acquire the number one position. However, at the instigation of two of Garling’s ‘colleagues’, the candidates were not listed alphabetically and Garling, allotted third position on the ticket, failed to secure a Senate seat. Givens duly sent a cheque to Garling for £3 to ‘purchase a very decent “Stetson” ’. Garling refused the gift, arguing that the circumstances surrounding the wager had changed. In February 1930, Garling was called to appear before the Senate select committee inquiring into the advisability, or otherwise, of the Senate establishing a standing committee system. He commented on the problems in getting Senators ‘to show sustained interest’ in the consideration of the detail of measures brought before the Senate. He referred to the Lands Acquisition Bill of 1922,which, he said, he had at the time made it his business to study in detail. He recalled the relevant minister describing the amending Bill as being ‘only a matter of machinery’, and commented that his own examination of it had resulted in bringing together an informal committee of Senators Keating, Benny, Drake-Brockman and Senator H. E. Elliott. Garling argued that Senate standing committees of five members would go some way to redress the problems that he had described. He believed that a selection committee of members chosen by the President of the Senate, the Leader of the Government and the Leader of the Opposition would guard against party influence, and considered that most bills should be referred to standing committees at the second reading stage. He supported also a committee ‘of zealous, earnest men’ to deal with regulations. ‘It was my experience’, he told the select committee, ‘during my short term in Parliament that not more than one-third of the 36 members of the Senate could be relied upon to perform their legislative duties conscientiously’. After leaving the Senate, Garling had received regular copies of Hansard, so that he could ‘keep in touch with doings in the Federal Parliament’. He continued with his law practice and maintained a public presence in the press. An address to the Millions Club in 1937 referred to his travel in Russia. His letters to the Sydney Morning Herald addressed not only defence issues, but also reform of the New South Wales Legislative Council and, understandably enough, the form of the Senate ballot paper. Fighting Line (Sydney), 27 November 1919, p. 15; Australian National Review (Sydney), 24 December 1921, p. 14. J. R. Odgers, Australian Senate Practice, Government Printing Office, Canberra, 1953, pp. 28–29; CPD, 14 September 1922, p. 2204, 29 June 1922, p. 24, 8 September 1922, pp. 2059, 2063, 2067, 29 June 1922, p. 27. CPD, 29 June 1922, p. 25, 12 October 1922, pp. 3684–3685, 29 June 1922, p. 26, 28 September 1922, pp. 2828–2829; SMH, 18 April 1922, p. 6. CPD, 28 September 1922, p. 2800; Letters between Henry Garling and Thomas Givens, Senate Registry file, 8161/S.103, NAA. G. S. Reid and Martyn Forrest, Australia’s Commonwealth Parliament 1901–1988, MUP, Carlton, Vic., 1989, p. 69; CPP, Report of the select committee on the advisability or otherwise of establishing standing committees of the Senate, 1930.
 Letters between Henry Garling and George Monahan, Senate Registry file, 8161/S.103, NAA; SMH, 16 December 1936, p. 15, 25 March 1937, p. 20, 21 March 1938, p. 8, 18 May 1926, p. 2, 9 March 1927, p. 19, 23 June 1937, p. 12. This biography was first published in The Biographical Dictionary of the Australian Senate, vol. 1, 1901-1929, Melbourne University Press, Carlton South, Vic., 2000, pp. 67-69.